The 2019 Sprinter is the third generation of the vehicle offered in North America since 2001. These gangly-looking tall vans have been loping around Canadian roads for 17 years, looking like an awkward Grade 9 student who grew faster than his peers. Appearances deceive. The Mercedes-Benz Sprinter vans drive with an agility that seems to defy physics. They may not be as fun to pilot as the company’s AMG sports line, but they don’t feel like a burden either. In fact, the experience of driving a Sprinter – from the quiet cabin to the responsive steering – is very car-like. As one of a group of journalists sampling pre-production models on South Carolina roads, I discovered how the van’s sophisticated safety systems are making it harder and harder to get into trouble with them. The features (all optional at extra cost) include adaptive cruise control, autonomous emergency braking, rear cross traffic alert and a 360-degree camera system. Autonomous emergency braking requires a lot of faith in the system. When the Sprinter is approaching another vehicle, the system triggers a warning chime at a driver-set distance and then, if the driver doesn’t respond, slams the brakes on. The rear cross-traffic alert works in a similar way – if the driver doesn’t react to a car passing behind during a backup manoeuvre, the brakes automatically go on hard enough to snap your neck. Even more welcome is the crosswind assist stability system. The massive sides of these vans are like sails, but a little electronic wizardry applies the brakes on the side facing the wind to keep the vehicle stable. The latest Sprinter has few noticeable differences from its previous generation, but what is different is the vast array of electronics and technology now available. The 2019 Sprinter is the third generation of the vehicle offered in North America since 2001. You’d be forgiven if you fail to notice the difference from the second generation. Subtle styling changes – particularly in the new front grille, LED headlamps and fender contour – are the only visual cues this vehicle has evolved. What is different, however, is the vast array of electronics and technology now available. The Sprinter features the new MBUX infotainment system (short for Mercedes-Benz User Experience), which is just now appearing in Mercedes’ passenger cars. It features either a seven or 10-inch touchscreen and can be operated by voice control, touchscreen, touchpad or touch control buttons on the steering wheel. Other optional tech goodies include adaptive cruise control and a 360-degree camera system. Mercedes PRO Connect – a system that allows fleet owners to remotely track and monitor the performance and condition of the vans – won’t be available in Canada until next year. This Sprinter will be built in South Carolina at a new $500-million factory in Ladson. It is a highly automated plant that will employ just 1,300 people by 2020 – relying instead on a series of robots and automated transport devices to do most of the heavy lifting and ensure quality control. Previous Sprinters were built in Germany, partly disassembled and then re-assembled in South Carolina to avoid a 25-per-cent import tax. It was a costly and wasteful tax dodge. 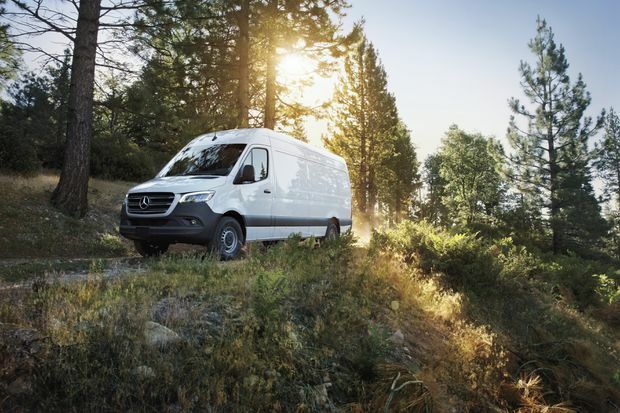 Volker Mornhinweg, head of Mercedes-Benz Vans, said building the vans in North America will “substantially” reduce production costs, speed up delivery times and allow for changes in an order much later in the process. The biggest German-sourced components are the engines and drive trains. The base engine on the two smallest versions of the van – the 1500 and 2500 – is a single-turbo boosted 2.0-litre four-cylinder, mated to a nine-speed automatic. We didn’t get a chance to try it out, but find it hard to imagine it inspiring. The 3500 and 4500 models come only with the larger, twin-turbo 3.0-litre diesel six- and a seven-speed automatic. It delivers a healthy 190 horsepower and 324 lb.-ft. of torque, which had no trouble keeping up in traffic. Mornhinweg said an e-version will be introduced in Germany next year, but North American customers appear not quite ready to try it yet. “It will take a while to convince customers there’s a good opportunity there,” he said. 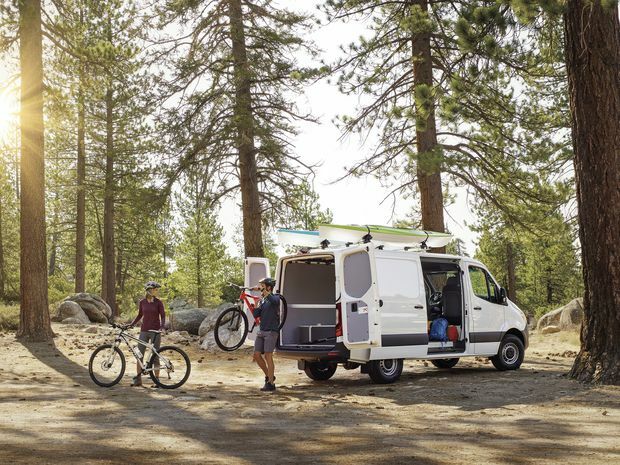 The Sprinter is offered in many configurations, but the three basic setups are stripped-down cargo van, passenger van and crew van. The Sprinter is being offered in a dizzying array of configurations – in fact, Mercedes claims there are 1,700 possible variations. 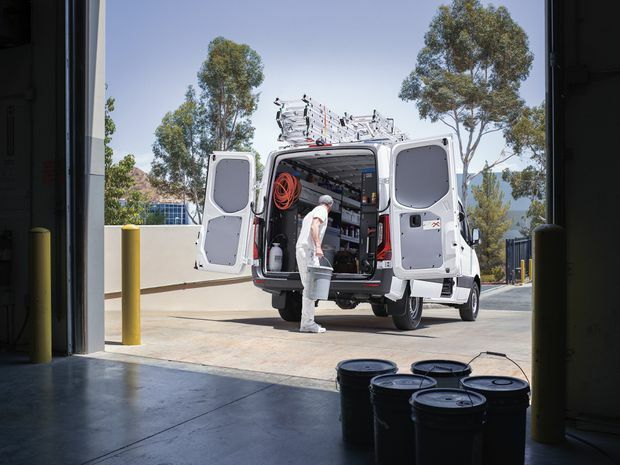 The three basic setups are stripped-down cargo van, passenger van and crew van. All are unibody construction, but there is also a custom cab-and-chassis vehicle, built on a full frame in Germany. Rear-wheel drive is standard in North America; all-wheel drive is available at the 2500 level and up. The Sprinter’s short version is on a wheelbase of 3660 mm; the longer 4320 mm wheelbase vehicles comes in two overall lengths. It also comes in different heights – the standard height of 2340 mm and the truly tall version, at 2830 mm. A basketball player could stay inside one of those with headroom to spare. The largest version of the passenger van can take 14 passengers, plus the driver. With such an overwhelming range of choices (the dealer ordering guide is 110 pages), Mercedes is providing trained consultants at dealerships to help customers figure out the shapes and features that work best for them. Mornhinweg calls the Sprinter a game-changer, and it’s hard to argue with him. More than 2.4 million of the first two generations were delivered in 130 countries, according to the company. Two of the Detroit Three have responded with lower-priced imitators – Ford’s Transit and Fiat Chrysler’s ProMaster. Only GM clings to the traditional van in its Savana and Express models. The biggest knock on the Sprinter is the sticker price: $60,600 in Canada for the diesel passenger van – and that’s before you add in some of those nifty safety and convenience features. Comparable Transits are about $15,000 less. Paying such a premium for the Mercedes badge is a tough choice for some consumers to make. All of the “tall vans” (the passenger version is nearly three metres tall) look a little gangly, but the utility of the design grows on you over time. The largest version of the passenger van can take 14 passengers. The entry-level vehicles have a Spartan feel on the inside. Optional luxuries, such as heated seats, bring the van up to industry standards. The six-cylinder turbo-diesel won’t win many stoplight races, but it’s powerful enough to keep up with traffic and pass smoothly. Mercedes has used a variety of technologies to make this tall vehicle feel extraordinarily stable, even in crosswinds. The new Mercedes-Benz User Experience (MBUX) multimedia system can be operated by voice control, the touchscreen, touchpad and touch control buttons on the steering wheel. Its smart cruise control keeps you at a chosen distance behind the car you are following. It also has blind spot, active lane-keeping, traffic sign, attention and crosswind assist software. The cargo van has a massive 488 cubic feet (14 cubic metres) of space. The cargo van has a massive 488 cubic feet (14 cubic metres) of space. The space in the crew and passenger vans has not been announced, but feels extremely roomy. The car-like feel, quiet cabin, stability, safety of this van make it a pleasure to drive, if you can get past the premium price it commands. 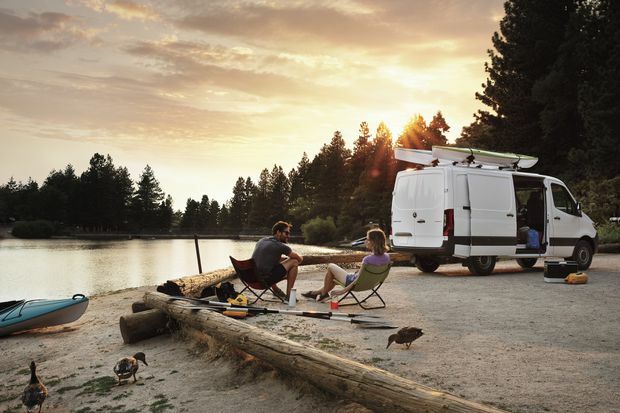 You’ll like this van if … you are a mid-sized business looking for a reliable fleet vehicle, a parent who transports the whole soccer team at once, or a vagabond, looking to outfit this vehicle as the perfect camper-van for two.